THE FIRST SELF-STUDY FCC LICENSE TRAINING COURSE OF ITS KIND! Recently, we completed a crash research effort to find out why so many people were missing questions on the FCC exam. Here's what we discovered. There are literally hundreds of text books on electronics published today - but none explain how to easily answer questions found on actual FCC exams. These books just gloss over the subject and leave the reader wondering. That's why our FCC LICENSE HOME - STUDY COURSE was developed - to provide you with clear pictorial examples, simple step-by-step solutions and reliable answers for FCC exam questions. Plus, you will be taught all the important basic principles behind the material you will need to know to get your license. understand information covering the answers to the FCC exam questions. 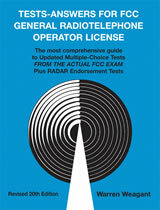 * Tests-Answers for FCC General Radiotelephone Operator License. an exact word-by-word copy of the actual FCC government test. * Simple step-by-step “Self-Study” Home-Study notebook and course outline. Everything is carefully prepared and edited to give you maximum focus towards successfully passing the actual FCC exam.